Our AquaArt Explorer Line is a beautiful aquarium for all fishkeeping fans. Its crescent-shaped front pane offers unique insights into fascinating, shimmering underwater worlds so that you can observe fish, shrimps and plants close up. The complete sets, available in 30 or 60-litre models, include all the equipment you need, such as the EasyCrystal Filter, an energy-saving LED light, a decorative poster as well as feed and care products. The well-thought-out concept is a hit with aquarium fans and experts alike. In fact, our AquaArt Explorer Line was voted Top New Product 2013/14 in the “Aquariums/terrariums/ponds” category by readers of the trade magazine PET. In September 2014, visitors at the Garten- & Zooevent trade fair also voted our highly innovative aquarium as runner-up in the “Trade fair championship”. This successful result is the sum of many factors: our aquariums combine an attractive design with modern and sustainable technology, enhanced functionality and user-friendliness. This way, you can delve into the unique hobby of fishkeeping straight away and set up your aquarium as a decorative home accessory that will be the highlight of your living or dining room, office or children’s room. 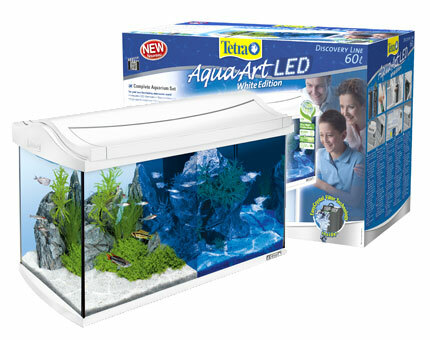 Other highlights of our product range include the 20, 30 and 60-litre versions of our Tetra AquaArt LED aquariums. As well as being convenient to care for, these aquariums also boast innovative equipment: the powerful, long-life LED light shows off fish and plants in the best possible light at any time during the day or night. In day mode, the LED light with a built-in switch for day/nightlight mode emits a daylight white light to support plant growth, while at night, it casts a soft-blue light over the aquarium. The integrated LEDs require minimal energy to guarantee optimum results and offer a service life of 50,000 hours. This makes them a highly economical and sustainable lighting solution as, unlike traditional fluorescent lamps, there is no need to replace the bulb every year. Our complete sets contain all the accessories you need, e.g. the complementary filter and air pump technology for the shrimp tank or the handy Tetra EasyCrystal Filter for the 30 and 60-litre tanks. The 60-litre version also comes with the Tetra HT50 Heater. Feed and care product samples are supplied with all models. Functionality and ease of use are two of the main priorities here, as with all Tetra AquaArt aquariums. The lid has several large openings, which make feeding simple and allow easy access to the equipment. Our Tetra EasyCrystal Filter produces crystal-clear, healthy water and is incredibly easy to clean. You simply need to replace the filter cartridge roughly every four weeks; there’s no need to rinse out the filter medium or even get your hands wet! The premium-quality tanks made from distortion-free float glass with bevelled edges are TÜV/GS tested, CE certified and come with a three-year warranty that covers the aquarium’s bonding, cover and lamp.